The blue eye trend has never been chicer. The sultry shades of the ocean, from clear aquamarine to deep sapphire, have always been the root of my attraction to the hue of blue. It's no surprise that Chanel's newest collection, Blue Rhythm De Chanel, has captured my heart. Inspired by the glamour and sensuality of jazz, Blue Rhythm celebrates the boldness of blue with dramatic eyes and lips that glow. This Thursday, Glamour Magazine will be hosting a special experience celebrating the launch of Blue Rhythm De Chanel at Bloomingdale's South Coast Plaza (my old hood! 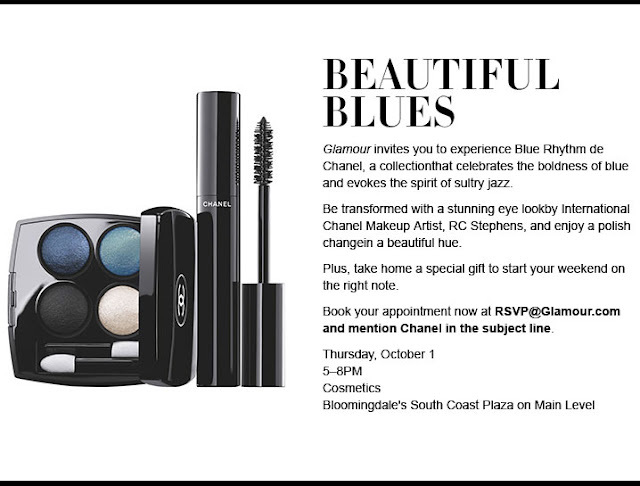 ), where Chanel's International Makeup Artist RC Stephens will be on site to transform your eyes with the collection's dynamic blue hues.